When it comes to the deep ball, Carl Whitley has become the Wildcats top option. It’s nothing for Whitley to put up a few only few catches a game, but to finish as the top yardage receiver for ACU. In only his first year at ACU, junior receiver Carl Whitley has already had a huge impact on the passing game for the Wildcats. The San Antonio native has put together 19 catches for 356 yards and two touchdowns this season and has several catches of over 50 yards. The coaching staff has continued to show trust in Whitley this season, as they have gone deep to him several times. Over the course of three games against Lamar, Sam Houston and Incarnate Word, Whitley was used exclusively for the home run play, putting up four catches for 176 yards. Of those four catches, one went for 50 yards, another for 51 yards and then another for 75 yards and a touchdown. Last game, redshirt sophomore quarterback Dallas Sealey found Whitley often throughout the game. 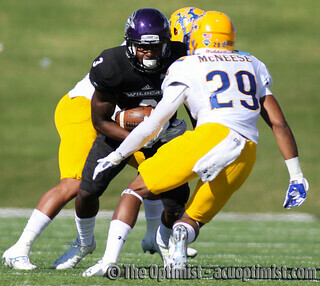 Whitley put together a season-high eight catches for 100 yards and a touchdown in the Wildcat’s loss to conference leader McNeese State. He and teammate Cedric Gilbert combined for 11 catches and 222 receiving yards. A transfer from Cisco Junior College, Whitley first considered ACU after comparison to Gilbert, who was also a former Cisco Wrangler turned ACU transfer in 2013. The San Antonio native began playing football when he was six years old by going to the local recreational center. Throughout high school, Whitley established himself as a deep ball threat. In his senior year, he put up 45 catches for 945 yards for a 21 yard reception average. As a sophomore at Cisco, Whitely caught 35 passes for 675 yards and six touchdowns. He also returned one kick for a touchdown. “My uncles put me in football when I was young, so I started playing flag and just made my way on up,” Whitley said. Whitley has found his place at ACU and in the relationships he has made so far. With three games left in the season, the Wildcats sit at a 2-5 conference record and are 2-6 overall. The Wildcats are in a five-game losing streak that has been heavily attributed to key injuries plaguing the Wildcats. Whitley says that the goal has become finishing off on a high note for the seniors who have contributed so much to the program. “We got three games left and we got a lot of senior receivers, five of them, but it’s currently at three able to play, because two of them have gotten hurt and we just want to try and send them out with a good bang and hopefully everyone can graduate and continue on in their success,” Whitley said. 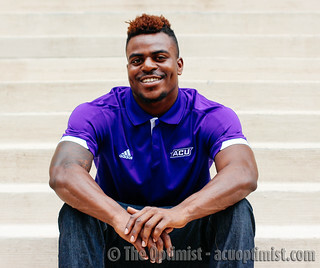 With another year left in his time at ACU, Whitley has the makings of becoming the Wildcats no. 1 option in the receiving game. For now, the Wildcats will continue to target the dynamic playmaker with long passes and hoping he can continue to get fans on their feet with his highlight catches. A Convergence Journalism major from Abilene, Tx.